This advertising card dates from sometime between 1920 (when Crown Coal & Coke Company was founded) and 1944 (when J.W. Wolgemuth Mill was sold to Mel Wenger, who founded Wenger Feeds on the property). 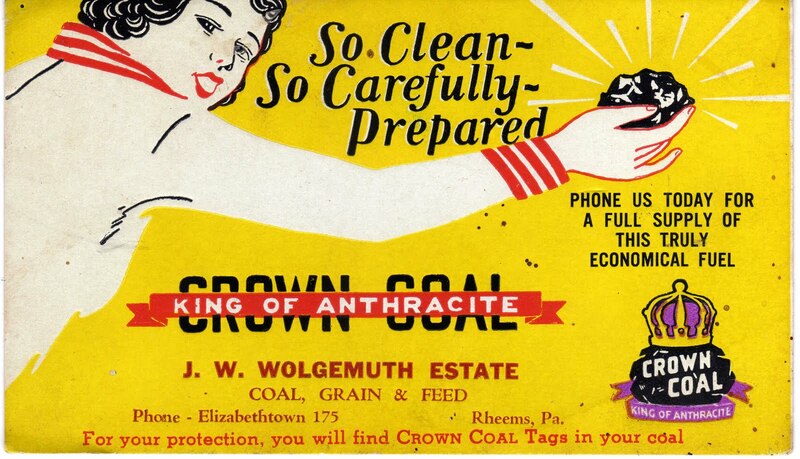 Interestingly, the reference to "clean" coal in this old advertising card doesn't mean quite the same thing it means today. Prior to World War II, clean coal (also called "smokeless coal") referred to anthracite and high-grade bituminous coal, which were used for cooking and home heating.1 Now, "clean coal" is a controversial term that refers to carbon capture and sequestration technology that may reduce emissions of carbon dioxide and other greenhouse gases when coal is burned. This notion of "clean coal" is highly debated. The Sierra Club2 has a website titled "Coal Is Not The Answer". After experiencing great success selling Purina feeds in his Elizabethtown, Pennsylvania self-service grocery store, founder Mel Wenger was approached by a Purina salesman about purchasing the J.W. Wolgemuth Mill in neighboring Rheems. Mel Wenger purchased the mill in 19443 and, throughout the 50's and 60's, developed a custom feed formula to meet the needs of the growing egg layer business in Lancaster County. The resultant M.M. Wenger feeds were extremely popular and filled a market segment that had previously been ignored. His success prompted Mel Wenger to drop the checkerboard and create an independent line of custom feed products. By the early 1960's, Wenger Feeds had expanded into poultry and swine production, eggs, and pullet growing. Wenger Feeds now specializes in feed for poultry, swine and specialty birds; eggs; soy oil; and the trademarked product SoyChoice, which is described as "premium expelled soybean meal". 2. And, in light of current events, the first thing you see today when you go to the Sierra Club website is "Nukes Are Not The Answer." The club provides a form letter you can send to your senators informing them of your stance on nuclear energy. 3. It appears that Wenger Feeds, picking up from J.W. Wolgemuth, continued to sell coal (probably Crown Coal) in the first years after its founding. The company no longer sells coal, clean or otherwise.